ePOCA is based on sophisticated securities accounting. Based on this, ePOCA enables investment reporting and controlling, both without additional effort. Asset management functionalities are ensured with a flexible visual concept. Millions of transactions and thousands of closings are successfully performed with ePOCA year after year. Since the ePOCA booking engine is the same for everyone, all ePOCA clients – whether large or small – take advantage of this unusual reliability. ePOCA – for whom ? Whether larger or smaller sales volumes, with ePOCA we can offer you an advantageous, tailor-made cost-benefit package. Already from a few hundred transactions / year the use of ePOCA pays off thanks to a license model based on the business cases to be processed. You pay what you need, gradually growing with your business success. For larger sales and transaction volumes we offer you a user-based license model. Mapping the business strucuture with client portfolio and "buffer"/"free assets" portfolios. Possibility of automated securities orders directly from ePOCA. A total dependability and reliability based on millions of transactions and thousands of closings executed yearly by our clients. A customized and intuitive booking of all transactions for all asset types. A distinctive efficiency for recurrent transactions (for example for account deposits). An optimal support for booking particularly complex transactions (for example time deposits or corporate actions). A state-of-the-art booking of all transactions, including all derivatives. See our article «La comptabilité des titres : le parent pauvre du processus de gestion» (also available in German). A flexible display of results with a drill down functionality for rapid valuations, internal revisions and efficient error search. A user-friendly reconciliation of holdings and balance of accounts, with optional market values and accrued interests. An investment reporting directly derived from the accounting data, without any supplementary effort and without discrepancy with the accounting. See our article «Von der Wertschriftenbuchhaltung zur Performance Messung». A perfect integration in existing systems with our modern interfaces to import data and export results. An automation of recurrent processes like reconciliations, closings and reporting. The strong know-how of our team guarantees high quality training and an optimal support. ePOCA can be used alone as a general accounting or as an auxiliary accounting to a general ledger (for example with Abacus). ePOCA is a multi-client and multi-currency software. The securities accounting of ePOCA is executed according to the most modern standards for all assets and all possible business cases. Transactions can either be entered manually based on the bank receipt or imported electronically. In both cases the booking of the transaction is performed automatically without manual selection of accounts. Through a series of strict checks errors are already detected while entering a transaction manually or importing it electronically. Moreover, the optimal drill down function for revision allows a user-friendly search of errors. Portfolios can be structured and consolidated as desired. The charts of accounts, booking periods and closing methods can all be set individually per portfolio. Working with preliminary transactions allows an easy correction of already entered or imported transactions. Moreover transactions can be preliminarily booked in the next closing period before the current closing period is completed. An extensive and clear documentation can be generated automatically for auditing purposes after every closing. And can also do «multiple accounting», which means according to several standards With all value adjustments methods authorized for the corresponding standards, for example lower of cost or market and amortization (linear or with effective interests). ePOCA generates the investment reporting directly from the securities accounting data. Thanks to the innovative booking of complex transactions, ePOCA can derive the investment report directly from the accounting data. The flexible chart of accounts automatically books the transfers resulting from the change of classification of assets. The securities’ accounting and the investment reporting can therefore be simultaneously adapted to the new situation. To define and check an investment strategy (strategic or tactical allocation). To calculate and compare the performance of the different asset managers and then to compare this performance to one or several standard or composite benchmarks. To monitor the performance of individual funds. To oversee the risk of your investment (standard deviation, Sharpe ratio, Value at Risk, duration, etc.). To perform a currency analysis, also in the case of a currency overlay. Here is an example of an investment report. The investment reporting is produced without any supplementary work: no double entries of transactions, no reconciliations required between the investment reporting and the accounting. A perfect congruence between the securities accounting and the investment reporting. Not to forget that the FER 26 norm specifically requires this congruency. In ePOCA, you can monitor your investment using a variety of analytical indicators. Investment controlling in ePOCA starts with a complete history of all important data. Thus all results are completely comprehensible. Even the performance figures can be tracked, thanks to a specific analysis export to Excel. calcualte the performance and risk for any group and compare it with benchmarks. analyze changes in assests and income to individual positions, regardlessof the chart of accounts, thanks to the profit and loss statement. monitor the investment strategy and investment tactics. present an overview of bank charges. ePOCA provides a package of functions for asset management. The concept of views in ePOCA is an ideal basis for asset management. The analysis is performed for any consolidation of portfolios, any grouping of securities. The screen can be freely designed as a combination of individual items, position groups, performance groups, transactions, due dates or visual elements. The "drill down" functionality allows the composition of a group to be analyzed with a single mouse click. compare your active portfolios with model portfolios and perform rebalancing. analyze currency performance and exposure. prepare for the comming due dates. The same technology is used for the financial reporting and the investment reporting. Several tools are also available which allow modification and individualization of the reports. Results can be exported in a «data warehouse» database. Personalized reports (content and presentation) can be created with the appropriate reporting tool. The redundant structure of the data warehouse facilitates the creation of template reports. Results can be shown in MS Office directly from ePOCA, via an XML structure and template reports with MS Office. The main advantages of this technology are on one hand the independence from a complex and expensive reporting tool, on the other hand the possibility to use the knowledge of the MS Office users to create their own template reports and to easily complete the generated reports. Results can be displayed in user-defined views. These views can be easily exported at any time in MS Excel, where results can be analyzed and processed as desired. Views also have a drill down function for an efficient navigation between holdings of the assets, balances of accounts, transactions and accounting allocations. Results can also be printed as standard reports (printing lists). These reports cannot be personalized, but are available at all times. ePOCA has modern data interfaces allowing its integration in all possible environments. An association between the ePOCA accounts and the general ledger accounts provide a perfect integration when used as an auxiliary accounting with a general ledger. The securities accounting can be transferred electronically in the general ledger, for example in ABACUS. The reconciliation between the data from ePOCA and the deposit bank (holdings list and balances of accounts) can also be executed electronically, as well as valuations and accrued interests. This can be done with an electronic interface to the custodian bank or from the electronic account statement (pdf file) with our module eSCAN. The securities data, prices, corporate actions data and the transactions can all be imported electronically from different sources. When transactions are imported, they will not only be read in the journal, but also booked totally automatically. The transaction interface is only based on the bank receipt, which facilitates the booking since it is independent of the booking standard or the portfolio’s chart of accounts. One of ePOCA’s strengths lays in its several automation possibilities. On top of the electronic import of assets and corporate actions data, assets and currencies prices and transactions, ePOCA can execute automations for repetitive tasks in the processing of the portfolios. Reconciliation tasks for an arbitrary number of portfolios on an arbitrary date can be defined and executed. A closing task allows closing several portfolios according to their own definition with only one command. Like this, processes such as the pre-control of the closings, the value adjustments and the delimitation of interests can be completely automated. Moreover, the reporting (either standard or individual) can be automated, including the archiving into a separate database (data warehouse). ePOCA is a standard software with a client / server architecture. ePOCA works with all clients with a recent version of MS Windows. ePOCA can also be run in a remote desktop environment. 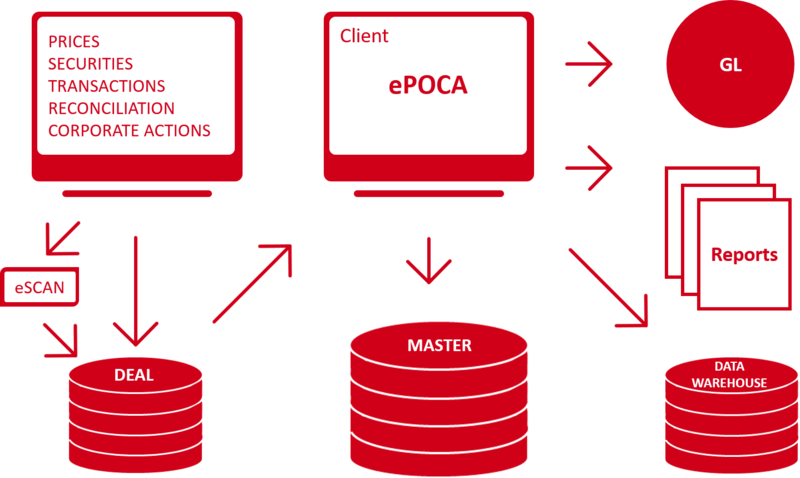 ePOCA operates with the databases engines MS SQL Server and Oracle, independently of the operating system of the server. Since the security and reliability have the highest priority in the accounting of securities, every change on the database is saved as a data base transaction. If the transaction does not work correctly, then the database will go back to its starting point (rollback). This allows the data to always remain consistent. ePOCA is written in the languages Microsoft Visual C++ and C#. All our clients work with the same ePOCA standard software: a guarantee for dependability and reliability. Alfred Müller AG is one of Switzerland’s leading real estate service providers. It uses ePOCA for its own securities‘ accounting. Securities accounting with investment reporting for the pension funds. Electronic interface with the data of SIX Financial Information. Securities accounting according to the RVB-FINMA for internal portfolios. These portfolios include shares, fixed income assets and trades. Electronic import of all data with automation close to 100%. Daily export in a general ledger. Securities accounting according to the different booking standards for certain clients. The BCV is using the same database and the same electronic import as for the internal portfolios of the bank. The portfolios of other banks are booked manually. Securities accounting with different charts of accounts and different value adjustments for corporations, foundations, trusts and institutions. The reporting is generated in different languages. Securities accounting according to the IFRS standard. DIVOR AG, founded in 1990, is a service provider for pension funds. It uses ePOCA for the asset management, the securities accounting and the performance reporting for pension funds, integrating mortgages and real estate. It provides an individual reporting. Securities accounting and investment reporting as the basis of decision making for the investments. PFS Pension Fund Services AG takes over all the management tasks of pension funds of ccorporations. It uses ePOCA for the securities‘ accounting and investment reporting of its clients, some of them with a «currency overlay». Securities‘ accounting and individualized reporting for the collective foundation Profond. Interface with the financial information of Bloomberg. Automatic import of transactions from the custodian realized with our partner company Infinys Systems AG. Securities accounting with performance report for pension funds. Export of the results in the accounting software Abacus. Securities accounting for all the global custody clients, according to the FER, US GAAP or IFRS standard. Optimal integration and advanced automation while considering every specific requirement of the different clients. Securities accounting, reporting and calculation of performance for institutional clients. Complete automation of asset transactions including corporate actions. Trust Accounting with consolidation of portfolios in different geographical locations, with restrictions of use between the locations. Securities accounting and individualized reporting for the foundations. Maygold Ltd. is an independant provider of financial and administrative services for corporate entites, family offices and private individuals. Maygold generates the securities‘ accounting for its clients with ePOCA and additionally delivers an investment report. Its clients regularly receive intermediate closings and a complete documentation of the annaual closings, reay for auditing. The investment report stands out with its comprehensive currency analysis and strategy check. Pension fund of the company KIBAG. Securities accounting with ePOCA. Electronic import of the main transactions from the bank. ASGA is the largest collective pension fund of Switzerland. ASGA uses ePOCA in the domains of asset management, securities' accounting, investment reporting and investment controlling. The investment reporting has a particular emphasis on risk analysis. Die NRS Treuhand AG verwendt ePOCA als Nebenbuch für die Führung der Wertschriftenbuchhaltung unter Verwendung einer direkten Schnittstelle in die SelectLine Finanzbuchhaltung (insbesondere bei Stiftungen). Trianon verwendet die ePOCA-Software für die Wertschriftenbuchhaltung ihrer Kunden und der Trianon Sammelstiftung. Die Benutzer sind über mehrere geographische Standorte verteilt. Sie werden durch Schnittstellen zu mehreren Banken für den Transaktionsimport und -abgleich stark unterstützt. Die Argos Gruppe verwendet das ePOCA-System für die Wertschriftenbuchhaltung der von ihr beauftragten Pensionskassen (gemäss Swiss GAAP FER 26). Die Ergebnisse werden automatisch über eine Schnittstelle in ihr Buchhaltungssoftware Syslog übertragen.